SARASOTA COUNTY — Local tourism officials never could have paid for the type of national attention Sarasota just got. Vogue on Thursday published a roughly 1,500-word editorial on why Sarasota is one of the Sunshine State’s best-kept secrets. The piece highlighted Southwest Florida’s sugary white sand beaches, but it also praised its architecture, dining and vintage shopping. Visit Sarasota County, the county’s tourism marketing arm, could never afford an advertisement in Vogue, said Virginia Haley, the agency’s CEO and president. But there’s more to it than that: There’s an authenticity that comes with an editorial, and because that can’t be bought, readers are more likely to trust it, Haley said. The piece, written by Vogue.com contributing editor Christina Perez, gives individual shout-outs to several local hot spots. She refers to the area’s mid-century modern architecture as a unique scavenger hunt of hidden gems and highlights the Sarasota Museum of Art and Marie Selby Botanical Gardens as cultural attractions. The Ritz-Carlton is her pick for lodging, and she gives individual descriptions of her experiences at the Casey Key Fish House, Star Fish Company, Owen’s Fish Camp, Shore, Lila and Indigenous. Sarasota’s transplant and seasonal residents make the region a hotspot for vintage shopping, and in the story Perez talks about her experiences browsing through local favorites. The Vogue piece was a complete surprise to Ashley Rogers, the owner of Canned Ham Vintage, which is among the stores featured in the story. The vintage shop got a write up in Coastal Living in the fall, and she’s still reaping the rewards from that piece. Shoppers come into her store holding copies of that Coastal Living issue, and she anticipates a similar reaction to the Vogue story. The Vogue story is Sarasota County’s second major media appearance in recent weeks. The area was also featured in the 150th anniversary edition of Harper’s Bazaar, which is on news racks now. Haley credits much of the attention to the relationships the agency builds with journalists and traveler writers as well as its push to get Sarasota on a number of “best of” lists. Conde Nast Traveler named Siesta Key Beach the 5th-best beach in Florida last year, and Longboat Key was the No. 9 best island in the U.S. in Conde Nast Traveler’s 2015 Readers’ Choice Awards. 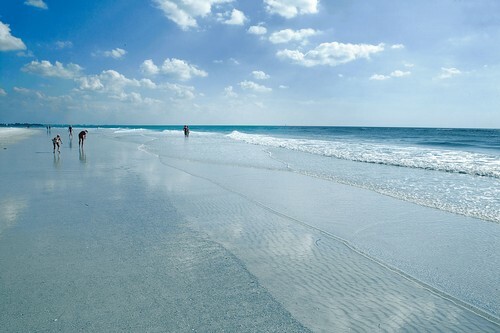 Siesta Beach, named the No. 1 beach in the United States in 2015 by TripAdvisor, came in 3rd last year.